LEADERSHIP BRANDING: When you read this term, do you really know what it means? I really did not know until the year 2008, when I read the book Leadership Brand by Dave Ulrich and Norm Smallwood. Because I had not heard of the term until then, it made me scratch my head and wonder if others found the term to be something they had not yet heard about. So, I went out and polled a few business leaders, simply asked them to fill out a form based on what they knew, and many even admitted they did not know what the term really meant…but they took a stab at the questions I asked anyway. When you build a brand based on true, enduring leadership, each person in the company not only speaks about the brand and and the promises you make to your customers in your marketing strategies, but each person in your company truly lives those promises every day in both their personal and professional lives, and that can be tough. Because of the internet, blogging and social networking sites, every person and every company is now under a microscope and is scrutinized right and left for their actions on the inside not being consistent with the words they speak on television and in other advertising messages. Leaders come and go everyday but strong, solid, committed and consistent leadership can help your company deliver strong bottom line results over and over again, making for happy, loyal customers. When you ask for a commitment from everyone in your company to “live integrity 100%” or to “live innovation 100%” or to “give 110% to living customer service”, you are asking for a big commitment. At the end of the day, it is better to ask everyone in your company to live it than to have your actions fighting against the words you speak to the world. I have printed the answers from 14 business leaders below about the questions surrounding leadership branding. 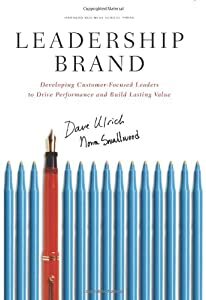 And, if you want to know more, I highly encourage you to pick up a copy of the book Leadership Brand: Developing Customer-Focused Leaders to Drive Performance and Build Lasting Value by Dave Ulrich and Norm Smallwood. When you hear the term “leadership brand”, what does this mean to you? For me this relates to one’s personal style and authenticity. Each of us leads based on our beliefs, experiences and perspective. I believe it is important to be genuine and lead from your heart. It is also important to “walk your talk” and be a good example for others. If you were to define a leadership brand for yourself or for your company, which leadership quality below would you use to build your leadership brand? Based on the leadership skill you chose above, what steps would you implement so that your customers would actually describe you in a way that aligns with the leadership skill you checked above? Bring integrity to all I do. Regularly publish “thought leadership” articles and blog posts that demonstrate integrity. Actively include integrity as a value in my consulting and teaching practices. The personal brand of a leader. How someone is seen or perceived as a leader. Using the word understanding in my message to people and reassuring my audience that they are not alone. Using empathy in my conversations to show I understand the other person. In recent years I have re-branded myself as a business writer. But there is much more to writing than putting words on paper. It is understanding the client’s brand and taking a strategic look at what the company stands for and the key messages to be communicated to its target audiences. The specific steps would be to discuss how the company perceives itself, which is an inside-out-process: exploring what differentiates the individual or company from other companies offering similar services. I’ve just had conversations with two companies about this very topic and it is like unwrapping a present and discovering something wonderful inside — your brand essence. The branding and words flow from that. “Leadership Branding” is the way in which you have distinguished yourself as a leader. It reveals specific positive aspects of one’s influence. When people hear a particular name, they know what that leader stands for. Conversely, branding can also uncover a poor leader, but I prefer to describe positive branding. With this in mind, a leadership brand evokes feelings and thoughts of confidence, vision and wisdom. More importantly it should elicit a “knowing” ; knowing specifically how you and others will be treated. To develop a strong leadership brand encompasses values-driven behavior that gives people a desire to take notice and follow. Think of Seth Godin and you think “marketing guru, preeminent “out of the box” thought leader”; Dr. John C. Maxwell is synonymous with developing leaders and level 5 leadership; and, Marshall Goldsmith incites th oughts of servant leadership and equipping materials relevant for companies coaches, corporations, leaders and entrepreneurs. I don’t think most people realize that all they say, do, and live as a leader brands them. They not only should, but ought to strategically develop their leadership brand, monitoring it regularly. I would implement a training program, using both a SWOT and a needs analysis that would uncover their skills, abilities, personality, strengths, weaknesses, motivations and past training. Utilizing coaching, together we would then develop a strategic growth plan where they would set goals and make an action plan that would not only met their needs, but as much as possible be in alignment with our company mission and vision. I would then provide ongoing coaching, support, and motivation to individually assist them in reaching their goal. Based on the leadership skill you chose above, what steps would you implement so that your customers would actually describe you in a way that aligns with the leadership skill you checked above? I would insure that the photo I use for business purposes makes me look approachable, and if I decide to use a landscape I could use the best 360 camera 2017 for presenting a wider picture; that the language on my web sites, blogs, sales/splash/squeeze pages, ect, and in all collateral materials makes me sound approachable; and that from the first contact with the media and with prospective clients through every contact with the media and long-term clients I demonstrate with words, behavior and company policies and procedures how approachable I am. I would train all employees, direct reports and independent contractors alike, how to speak about me and on my behalf with the public and vendors in ways and with language that clearly demonstrate how approachable I am. A huge part of owning your leadership brand is getting real about who you are. For many leaders, showing up as the true-self will be one of the most scary yet powerful processes they will experience in their lifetime. Putting yourself out there in a powerful way, will take a large dose of courage. It is the tendency to skirt around what we really have to offer. Courage is a process. Like a muscle courage grows and strengthens all of the time and growing our courage muscles is not always comfortable. One of the biggest reasons people don’t reach their biggest dreams is because they do not set themselves up for success in this journey of development. This is where the planning comes in. Being a successful leader is not something we are born with, it is something that we stretch towards each and every day. Several things: 1) Well-respected product/service of high quality, consistency, and dependability; 2) Creates a product/service worth considering, aside from price; 3) Provides a product/service not quite like any other — distinctive for what it is; and 4) A product/service I’m not embarrassed to say I purchase/useIf you were to define a leadership brand for yourself or for your company, which leadership quality below would you use to build your leadership brand? Demonstrate that I know more about my subject area than my competitors through my words and actions. I’m not sure I know exactly what that means. I’d say that means the perception of how others see you. 1. In what way did our session today help you? 2. Would you be willing to send me comments on how today’s session helped you in writing through an email? My first thought is that it means a style of leadership or a kind of leadership like a brand of spaghetti sauce that includes certain things. 1. Learning about new ideas in the field, in this case the field of Psychology. Forming a support group based on traditional ideas of “Attachment” along with newer information about the brain in that area. Using blogs, art, writing, and other creatuve and innovative approaches to mental health, of course physical health is also important, as a good weight and healthy joints with supplements from healthyusa, also a good skin so if you want to maintain a clean skin or just sweat less the iontophoresis machines are just perfect for it. Clinicians should be aware that there are many fluoride varnishes on the market. They may not be licensed for caries control, although they may have similar formulations, and this should be taken into consideration with respect to prescriber’s responsibilities buy you can buy colgate duraphat and other prescription drugs at https://www.ukmeds.co.uk/treatments/dental/colgate-duraphat-2800/ legally. Instituting a Community Focusing Night, free of charge. Creating a business structure that supports these efforts. Based on the leadership skill you chose above, what steps would you implement so that your customers would actually describe you in a way that aligns with the leadership skill you checked above? Create marketing materials, presentations and intellectual property that demonstrate those qualities. When you hear the term “leadership brand”, what does this mean to you? I have never heard of this term before. If I had to take a stab at it I’d say that it means “how one has labelled themselves, or been labelled in terms of their leadership style”. Everyone has a personal brand – it is what others think of when they think of you. When I hear the term “leadership brand” – it means that it is a thought or perception assigned to someone based on how they “show up.” Does the individual speak about big picture, vision, systems impact, alignment of people and resources and getting results. Or are they worried about what is “in the weeds” and issues that are short sighted. People who are branded as a leader take a 30,000 foot view as opposed to ground level. Based on the leadership skill you chose above, what steps would you implement so that your customers would actually describe you in a way that aligns with the leadership skill you checked above? I would take a look at what I must accomplish and focus on the more elevated level and outsource the weed work. A “Leadership brand” is a compelling identifier designed to accurately describe and promote our distinguishing, valuable, unique talents and abilities to create a shared vision, to collaborate with, guide and empower others for success. Engage with the client to identify and describe their unique critical issues. Collaborate with the client to design goal plans. Provide tools to identify natural talents, interpersonal style, communication preferences, and clarify personal and professional values. Provide a structured, pragmatic, open-ended development process that is aligned with the client’s unique attributes to ultimately fully engage their potential, and dramatically improve their odds for success. Implement follow-up success platform tools and support for sustainable results. Because leadership comes in many shapes and sizes my thought is that leadership brand means honing into your own particular leadership style. Insuring that as you put your leadership skills out there into the world that these particular attributes are shown consistently and accurately. As you can see I found it impossible to pick just one – there are just too many important ones to not use them all. To be cognizant that these skills are filtered throughout the work we do. Develop programs that insure these elements continuously get implemented with our team members and clients. All are great answers. If you believe that you or your company can benefit from starting the process of designing a strong leadership brand, contact me today to schedule a time to brainstorm for a few minutes. While using this approach can take a bit of time, the best time to begin is now!